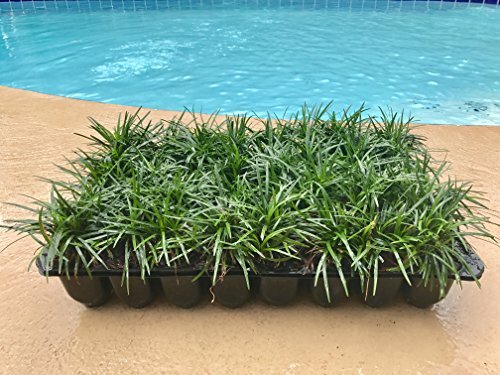 Qty 72 fully rooted Dwarf Mondo Grass or botanical name Ophiopogon japonicus 'Nanus'. Creates a lush groundcover of dense, dark green grass-like clumps. This dwarf is only half the size of the regular species. Excellent as an edging plant or tucked into rocks for a pleasing contrast. This dwarf variety, only half the size of others, creates a lush groundcover of dense, dark green grass-like clumps. Excellent as an edging plant or tucked into rocks for a pleasing contrast. Striking in mass plantings in the landscape. Evergreen. This perennial evergreen grass is dense with dark green foliage. Its slow and clumping growth habit reaches only 4-6 inches tall(4-6 inches wide). This ornamental grass is widely used in rock gardens, seashore plantings, borders and groundcovers. This low-maintenance evergreen needs a regular water schedule to ensure the growth of a mature root system. After the mature root system is established, watering is needed occasionally, except during a drought, watering is needed regularly. Pruning old foliage is recommended to maintain a well-groomed appearance. Dwarf mondo grass is similar in appearance to a ground cover commonly called Lilyturf (Liriope muscari), but has thinner leaves and a finer texture. Once established is drought-tolerant and resistant to pests and disease.